Last weekend we had a blizzard here on the east coast. I still remember the Blizzard of 96 as a kid, so blizzards with kids are memory makers! 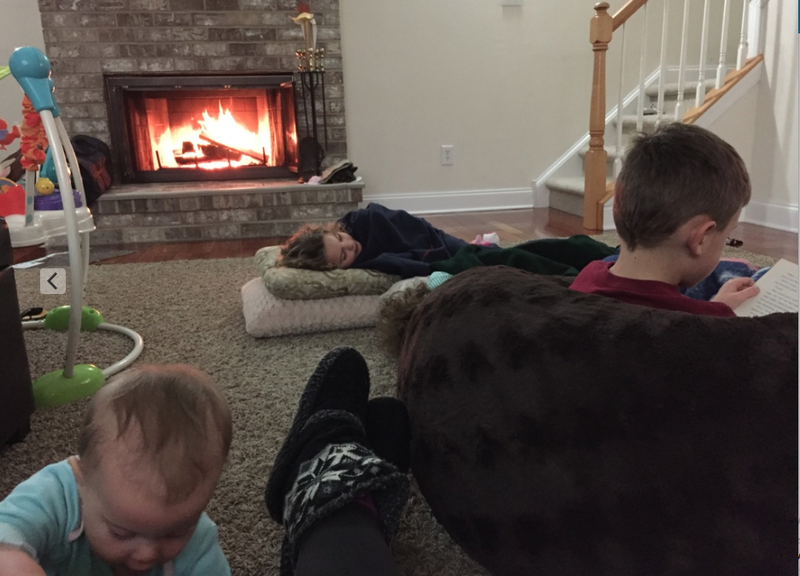 Lots of hot cocoa, sitting by the fire, playing in the snow, tears, getting snow suits on and off, using the dryer 100 times, loading up on vaseline on the lips and dry spots, baking, hanging out, reading, and eating! I made Minimalist Baker’s oatmeal – I thought it was great – of course the kids wanted nothing to do with that. We also made Martha’s skillet cookie, delicious. I saw the picture of the skillet cookie a year ago when I was pregnant and needed to make and eat it immediately. We’ve never turned back! It’s a very easy recipe and it’s delicious. Skip the egg, use vegan butter and you can make it vegan. Why can’t they eat dinner like they eat sweets? As far as hot cocoa, I use a can of full fat coconut milk mixed with regular almond milk, add cocoa and maple syrup to taste. What’s your favorite hot cocoa recipe? We spent Sunday digging out and the kids loved playing in the snow. It wasn’t freezing outside so it was great playing weather. They had Monday off, and delays Tuesday and Wednesday. I really enjoyed all of the extra time with them. We colored printable snow globes, played in the basement, and of course there was lots of bickering too! But in the end, the best part about snow days is making memories! In the past few weeks, I’ve used free meals from Plated and discounted meals from Green Chef to try out the services. I liked both of them but I’m more of a throw something together type at this point. I was impressed by Green Chef which is all organic ingredients. I’ll share my thoughts on those services in a post soon! I have not even thought about meals for this upcoming week, and last week was throwing things together! So tell me what you are making this week!